Davos is in full swing, and this year's conference reveals a much grimmer global economic reality than last year's did. PIMCO's Studzinkski raised three specters of problems challenging the world geopolitical economy with the protectionist policies of President Trump, the Brexit Crisis, and the rise and election of Brazilian President Jair Bolsonaro. It is only the latest reminder of why you can not count on global equities' markets to be moving in a consistently straight line up. Gold makes sense in an IRA exactly because the world order has increasingly come unglued over the last several years and looks like it will only continue for the foreseeable future. Now is the time to start including some IRA-approved gold in your retirement portfolio. It is easier and safer than ever before now that you effortlessly can store your IRA gold in top offshore storage locations. The sad truth remains that financial markets have not yet come to grips with the continuing fall of populist dominoes around the world. It is clear that markets are going to have to start coming to terms with the policies and agendas of the new populist leaders sooner or later. Realities in the U.S., U.K., Italy, Brazil, and other nations make this increasingly obvious. In late October of this past year, the populist leader Jair Boslonaro of Brazil became the latest leader to win his country Brazil's presidency. He campaigned aggressively on a Trump-styled nationalist agenda. The right wing leader followed in the footsteps of Mexico's President Andres Manuel Lopez Obrador to become only the latest in the rising cadre of populist leaders of the Americas. Davos is especially nervous about the many problems in its own backyard this year. Europe, normally a beacon of calm in the global geopolitical storm, has as many problems as any other continent this year. Besides Brexit, we learned from Eurostat (the statistics office of the EU) this week that the 19 member euro zone's economy grew at its worst speed in four years for the third quarter 2018. Apparently the warnings of the International Monetary Fund are coming to pass. Their most recent economic outlook report warned that the uncertainty created by the United Kingdom's imminent exit from the European Union is now a serious risk to the economic health of the entire EU. Worse still for the cultured continent, the most recent financial crisis from a decade ago has emptied the ECB's proverbial toolbox. They have next to nothing left to use against the upcoming economic downturn, according to the CEO of multinational Dutch conglomerate DSM. The IMF upped its risk warnings on Monday to future economic growth in the nations of the euro zone. They especially mentioned Germany and Italy. The greater problem is the long-lasting Sovereign Debt Crisis of 2012 that forced the European Central Bank into an aggressive and desperate bond buying quantitative easing program has not left much in the regional stimulus tool box to handle another unfolding economic crisis. What the ECB will do in response to the next unfolding economic crisis is anybody's guess. These are stark warnings coming out of the world's largest GDP and global trading block the European Union. Ignore them at your own peril. In a recent telling survey of CEOs hailing from the most important global corporations, the company bosses have revealed an all-time high increase in pessimism towards international growth prospects. The PwC survey was time released to coincide with the World Economic Forum in Davos, Switzerland. This survey polls an impressive 1,300 CEOs from around the globe. It found that almost 30 percent of global business leaders feel international growth will drop over the coming 12 months. This is roughly six times the numbers from last year's survey. According to the warnings of Gonzalez, the lack of international cooperation on a global scale in improving international trade rules over the last few months is only one important example of a longer term risk to global economic growth. Volatility that was such a defining theme in global markets last year has returned. The last unwelcome bout of wild volatility caused international equities to post significant losses in December 2018. Making matters worse are the critical geopolitical thorny issues such as the United States and China's ongoing trade war, plus Brexit's upcoming climax. All the while, the increasing worries of slowing economic growth around the world do not show any signs of letting up. The problems and concerns are serious enough that most market players believe the Federal Reserve is now paused in its interest rate raising agenda until further notice. The number of threats to your retirement portfolio are only growing with each passing day (especially as the potentially troubling Brexit finale nears in two months). You can take counter measures by buying gold in monthly installments. Now is the time to review the Gold IRA rollover rules and regulations while you still have the time and relative calm in the storm to do so. 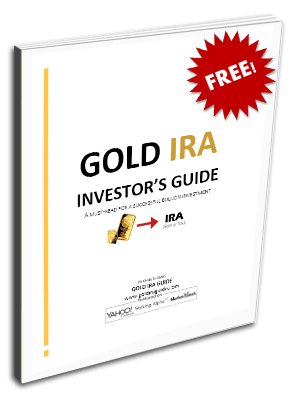 The top Gold IRA companies and bullion dealers are ranked for your convenience.